Fresh artichokes can be a little intimating to cook with, but Chef Patrice will teach you a technique to make cooking artichokes easy. 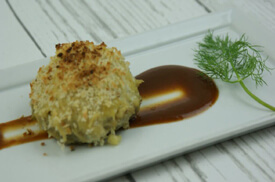 For this class, we will stuff the artichoke bottom with crab meat and mix it with a delicious creamy sauce. This class also includes instruction for a Tomato, Eggplant and Mozzarella Calzone.